Graduation is right around the corner! Do you have a special senior in your life? Are you looking for custom graduation invitations that will stand out from the other classmates? 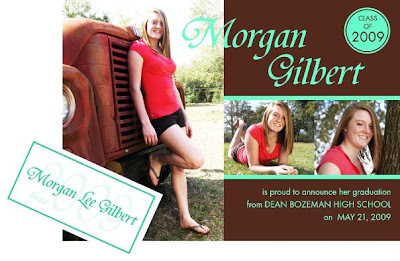 Here at Creative Printing of Bay County we offer custom, affordable graduation invitations. Custom invitations are a great way to display your graduate’s senior portrait, creating a unique style. In need of name cards as well? You’re in luck, we design custom name cards to match your custom graduation invitations. Here are a few of our newest designs to get your creative juices flowing. Graphic Design is everywhere! We see it on street signs, billboards, television, online, in restaurant menus, business cards, books, and many other places. Graphic design combines text and images in a creative manner in order to reach a particular audience visually. They make things “look pretty” in order to grab the target audiences’ attention. A logo is not just something that is visually appealing it is creating a brand and communicating what a company is/does without much needed explanation. The first stages do not involve much designing at all, but more so research. Creative Paper for Creative Projects! Do you ever wonder what type of paper you should use for your CREATIVE PRINT PROJECTS? Often people do not realize how many choices they have available. Then when it is time to choose, the many varieties of paper can be overwhelming. What color? What finish? What style? Paper selection can make a huge impact on your print project whether it is for yourself, your family, or your business. Is there a high school senior in your life? Chances are, they've already been given information about ordering expensive graduation announcements through their school. They might have a few options to choose from but one thing is certain: those announcements will look an awful lot like the announcements all their classmates will be sending out. Why not make your senior's graduation truly special and get them a completely custom graduation announcement that not only shares the news of their graduation, but also includes their photo?